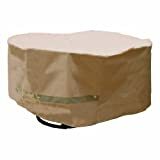 Our Hearth & Garden furniture covers are made of ultra heavyweight material designed to keep your outdoor furniture looking beautiful longer while cutting down on day-to-day cleaning. Crafted of a unique, high quality, 380gram PVC coated polyester that resists cracking, fading, or scratching your furniture. They are also highly water resistant. These covers are a fashionable addition to your outdoor environment that you can enjoy year round.